Image of black swan in Galway. Photo by author. ​Do omens seems superstitious to you? Does the word 'omen' conjure up a sense of doom?! What if we were to use them alongside astrological analysis to gain an objective view? The negative connotations of the word 'omen' has much to do with cultural biases, based on the movie The Omen, for example. The word also sounds a lot like the forbidding word 'ominous'. Whatever the reason, there is a tendency to think of something negative coming down the line when thinking of an omen - especially if the omen comes in black! A new visitor has arrived in Galway, where I live. A black swan, native to Australia. This is the first time a black swan has ever been seen in Galway. And it was first spotted as Uranus was about to enter sidereal Aries. Uranus, the planet of shocking and unpredictable events, has just entered sidereal Aries, the sign of initiation and new beginnings. The very nature of a 'black swan' event is one that is unpredictable. The term 'black swan theory', developed by writer Nassim Nicholas Taleb in his book of the same name, shows historical events which we are all blindsided by. Events which have a huge impact on world affairs. 'First, it is an outlier, as it lies outside the realm of regular expectations, because nothing in the past can convincingly point to its possibility. Second, it carries an extreme 'impact'. Third, in spite of its outlier status, human nature makes us concoct explanations for its occurrence after the fact, making it explainable and predictable'. Omens are all around us if we choose to look and are open to seeing messages laid out before us. Once, while working on a new website for a movement therapy business, Vayuveda, meaning the 'science of movement', I was thinking about the appropriateness of the name I had chosen. That same day whilst driving, I could make out a figure I approached. It was a man cycling a bicycle, dressed in medieval costume, with a bow and arrows over his back! ​This may seem a little unusual but not particularly significant, until you are aware that Lord Vayu is depicted holding a bow and arrow: a symbol of the swiftness of air and the ability to direct Prana; the 'life-force'. This message would have been lost on all but myself on that road that day. We call those 'signs', not omens, as the word 'sign' implies a signpost for us to move in a certain direction. The word 'omen' on the other hand, implies something we may not be ready to experience, and we may need a gentle nudge before something unexpected is about to happen. Here is another example of using omens alongside astrological analysis to predict mundane events. The example of the Antares rocket explosion relates to mundane events because of the global observation of the explosion, as opposed to a personal sign, viewed by an individual in a very specific set of circumstances. The month before Saturn moved into sidereal Scorpio, in November 2014, the rocket named Antares exploded soon after lift off. I have included a video clip as a reminder. To most, this event was a disaster for NASA but not particularly meaningful beyond that. To an astrologer, however, this event had huge significance. This was because Saturn was about to enter Scorpio when the rocket exploded; a sign which contains the lunar mansion, Jyestha, where the star Antares is placed, and where Saturn will back into in June 2017. Antares means 'rival of Mars', as it appears as bright as Mars. It is as if the symbol of an exploding Antares was a representation of a failed attempt at lift off in our own lives, and a need to return to the fears that dominated in 2016. Now that Uranus has moved into Mars' sign Aries, transiting the sign for the next 7 years, we are bound to see many more upsetting and shocking events, thanks to Uranus and its influence on the planet of war. One example of the significance of this is what Time magazine covers in their article, Inside the Uranium Underworld: Dark Secrets, Dirty Bombs. Uranium is a heavy metal used for its energy in a nuclear reactor which was discovered in 1789 by Martin Klaproth, a German chemist, It was named after the planet Uranus, which had been discovered eight years earlier. The full significance of this has still to play out, of course, as Uranus has just entered Aries, and Saturn returns to Scorpio, and the star Antares, in the summer of 2017. Saturn's transit here in 2016 educated us in what war looks like in our modern era. ​Saturn continues to have a huge impact in 2017. Eclipses are, of course, the most common omen in an astrological context. They are the most intriguing, observable astrological phenomenon. They grab the attention of everyone in a more dramatic fashion, and are often used to predict the fall of a leader, for example, particularly when conjunct the south node, Ketu, as was the case in September 2016 (e.g., David Cameron's resignation from Parliament). The upcoming eclipse on August 21 2017 is a total solar eclipse, visible in America: a country that is currently experiencing a 'Rahu time-period', and is therefore open to the changes the eclipse itself signifies. Huge changes are on the agenda for the country, in particular in the way they are governed, as the eclipse is occurring in the sign Leo, and the 9th house of laws and policies. I use omens frequently in my own life, but make sure to back them up with an astrological analysis so as to have a more objective view of a possible outcome. If I see many indications when looking at mundane events, and an omen points to one particular outcome, then of course I will study that one more thoroughly through astrological analysis. I do not use omens for personal consultations, however. I feel the study of omens is a personal interest and not to be dabbled in for private readings. I test drive a lot of techniques on myself for many years before I am confident in using them on others! ​What I have experienced, however, is that client's will say to me that they saw something that intrigued them and wondered about its significance. In that case, we explore it using astrology and see if indeed it is relevant. Omens can be very personal messages, or universal signs which do not impact the individual profoundly. I once heard of someone who would predict how her day would pan out by the way the waters near where she lived rippled as she passed in the morning! Reading signs, through various scenes presented to us in the natural world, is one of the easiest ways to begin to apply the wisdom of natural omens, or signs, to our everyday lives. As I write this article, Galway city has been engulfed in a huge plume of smoke due to out-of-control fires that have destroyed thousands of acres of forestry and bog land. Was the black swan an omen for such an event in Galway? 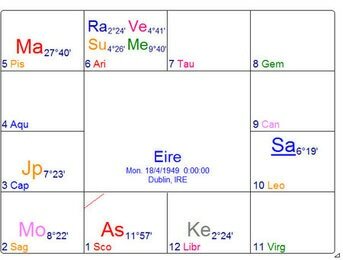 Applying astrological analysis, we can see that Ireland's horoscope has the sign Scorpio rising, the sign in which Antares resides, while the planet Saturn rules the 4th house of homeland for the country's chart. The housing crises deepens every year for the country, while its future trading and links to its neighbor, the UK, is far from safe due to the recent Brexit (Saturn also rules the 3rd house of neighboring countries). Saturn has yet to return to Scorpio - it does so from June 21 until October 26 - but its precarious position between Scorpio and Sagittarius throughout 2017 sees many structures Saturn represents falling apart - slowly but surely. As long as we are on board with what needs to be cleared - like fires burning stubborn bush to clear the land - we can clear out our lives of any build up of excess - rising like a phoenix from the flames.